January 23, 2013 – Media! Tech! Parenting! Those of us with seniors and elders in our families know how important it is, in this digital age, to ensure that children communicate with grandparents, older relatives, and even elder family friends. In many families, grandparents and other senior relatives benefit and gain more technology skill with the help of their digital-age grandchildren, nieces, and nephews. Once a family senior gets immersed in intergenerational digital communication, he or she often wants even more connections — at first more contact with younger family members and then with … the world. Interestingly, only a few years ago most seniors were satisfied with e-mail communication or the occasional video to watch. Not anymore. Today a growing number of people over 65 are enthusiastically latching on to social networking sites and using them on a fairly regular basis, and these numbers are growing. This amazing graph depicts the percentage of adults at various ages who used social media sites over seven years, and it demonstrates how fast the use of these sites is increasing for all age groups, but especially for seniors. Published in the Pew Internet’s July 2012 report on Older Adults and Internet Use, the information in the image comes from a Pew survey that collected data between March 2005 and February 2012. Note the growth for the 50-64 age group and the over 65 age group (data that could hardly be detected back in 2005) over the years of the survey. 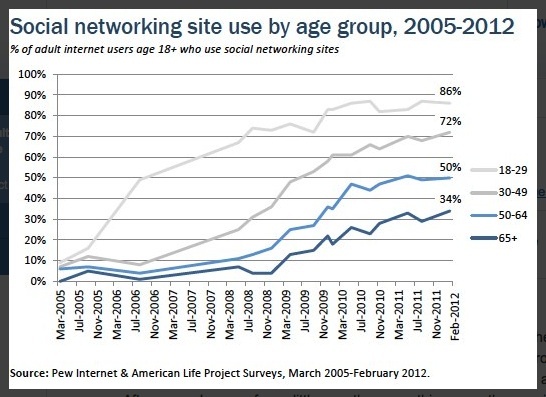 Moreover, the social networking adoption percentage numbers for people 50 and older picked up a lot of steam, between July and November 2008. Bottom line? Many more older adults are signing up and using social media sites, and their numbers are continuing to increase. One way that young family members can be especially helpful is to be on the lookout for seniors relatives who can use extra support as they learn more about living lives in the digital world. The French essayist Joseph Joubert (1754-1824) wrote, “To teach is to learn twice.” Children relearn and review their own digital world lessons when they teach senior family members about learning and communicating in today’s always connected world. It doesn’t matter whether they are helping with privacy issues, teaching a senior to understand a cell phone, or demonstrating the many other virtual world tasks that a grandparent or elder relative might need to know. In helping that older family member learn something new, the child refocuses on the lesson. That’s pretty cool for everyone involved.